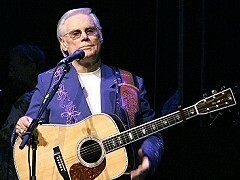 The guest list for George Jones' final show keeps growing. The 82-year-old legend, who announced retirement after a farewell tour this fall, will sing to his fans for the last time in Nashville on November 22. Previously announced guests include Tanya Tucker, Randy Travis, Jamey Johnson, Charlie Daniels, Lorrie Morgan and Gene Watson. 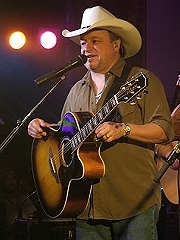 This week Jones called Mark Chesnutt and personally invited him to join the cast of special guests for the final concert. Mark Chesnutt comes from George Jones' hometown of Beaumont, TX and the legend has been a mentor of his carreer since the very beginning. Jones even wrote liner notes for Chesnutt's debut album Too Cold At Home in 1990. Through the years the two have recorded a number of duets and remained friends. On November 22 Mark Chesnutt and George Jones will perform together for the last time at the Bridgestone Arena in Nashville. George Jones & Mark Chesnutt - "Good Ones And Bad Ones"
Mark Chesnutt: I Ain't Gonna Rap!